You may have never heard of Kraftwerk unless you are a true Retro lover however you most certainly heard their music or their musical influences on other artists. Artists like Depeche Mode, Yazoo, Ultravox, Devo and David Bowie all owe their sound to the ground breaking efforts of these four German electronic originals. 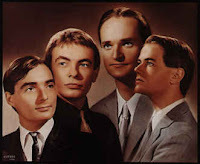 Founded in 1968, Kraftwerk tried to carve a sound that was uniquely German. They experimented with new technologies and relied on the industrial world around them for inspiration. Album after album their innovative approach to creating new sounds attracted the attention of young musicians and by the early '80s, pretty much every new wave / synth group credited Kraftwerk as a major influence. This made Kraftwerk's Euro sound a dance floor staple. Th0ugh Trans Europe Express was released in 1977, it eventually caught the attention of an American DJ who went on to release a little ditty you may have heard of - "Planet Rock" by the Soul Sonic Force masterminded by Afrika Bambaataa who dubbed Krafterk "Funky futuristic white boys". Planet Rock was the catalyst to the whole Electro Funk sound that became synonymous to the whole '80s sound.